At first glance, the scene looks like any other cozy camping spot. But a closer look reveals the trappings of an enchanted forest. 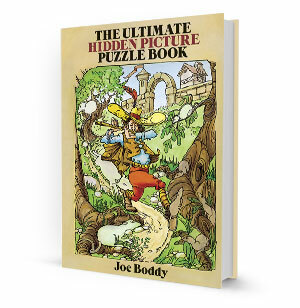 This and 23 other delightfully drawn tableaux challenge sharp-eyed sleuths to ferret out cleverly concealed objects in artist Joe Boddy's immensely entertaining hidden picture puzzle book. These intriguing pictures also offer hours of coloring pleasure.